The Complete Book of Garlic by Ted Meredith is considered by many to be the best garlic book available. Garlic books can be invaluable when you’re first exploring the wonderful world of garlic, especially the best garlic books and guides plenty of illustrative photos. Talk of scapes and bulbils can be confusing and photos really are worth a thousand words when it comes to describing things such as when to harvest garlic and the proper way to plant garlic. 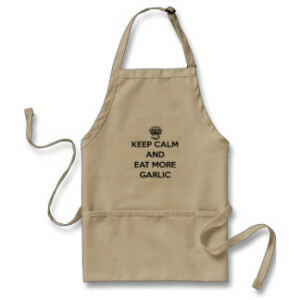 It’s hard but try to avoid the temptation of jumping right in, getting your hands dirty, and planting a ton of garlic. Take advantage of the guides and books out there; even just a single photo or paragraph could save countless hours and headaches. For many years growing gourmet garlic in the U.S. and other countries was a solitary effort, with very few comprehensive guides or any information at all about the many different garlic varieties available. That’s slowly changed over the years, aided immensely by two great books on garlic: Growing Great Garlic: The Definitive Guide for Organic Gardeners and Small Farmers by Ron Engeland and The Complete Book of Garlic: A Guide for Gardeners, Growers, and Serious Cooks by Ted Jordan. You’ll find these two books on the bookshelves of many growers and garlic enthusiasts, forming the foundation for the efforts of thousands of garlic growers around the world. Growing Great Garlic by Ron Engeland was the first garlic book to lay out different garlic groups and provide detailed growing and harvest tips. Growing Great Garlic was originally published in 1991, well before the current rise in popularity of garlic and its many different cultivars. Engeland’s book is aimed primarily at organic gardeners and small-scale garlic growers, hitting all the major highlights such as when to plant, harvest, and fertilize garlic. Engeland’s background from decades of experience making his living by growing and selling organic garlic shines through, with much of his information designed to be immediate and practical and no-nonsense. Growing Great Garlic has tips to get started growing garlic for everyone but it does skew slightly towards those looking to generate income from their garlic crops, so home gardeners who just want to plant a few cloves may be overwhelmed at first. Engeland was the first to try to classify garlic into the major groups that we know today such as Artichoke, Creole, Rocambole, Purple Stripe, and so on. He didn’t have the benefit of any genetic anlysis of garlic to work with but his classification system detailed in Growing Great Garlic was largely backed up by genetic analysis done later in the Fort Collins study. 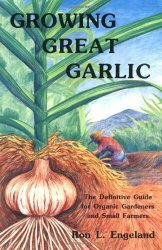 Growing Great Garlic remains one of the best garlic books available and its easy, informative style and detailed information is still guiding garlic growers today. The Complete Book of Garlic combines lush photos and detailed info on all aspects of garlic. Ted Jordan’s The Complete Book of Garlic: A Guide for Gardeners, Growers, and Serious Cooks packs a hefty punch, with the hardback book delving into all things garlic. The amazing large color photos make it seem almost like a coffee table book at times but make no mistake; this book is crammed full of useful information for garlic cooks, growers, and enthusiasts alike. 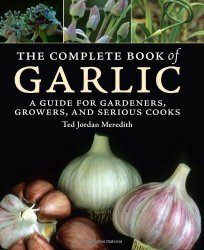 The Complete Book of Garlic tackles garlic from all angles and Jordan’s hands-on experience shines through as he discusses growing garlic, selecting the best variety for your area, and efforts to grow garlic from true seed. The author pulls together garlic tips and data from a wide range of sources and logically moves through the many dos (and quite a few don’ts) of growing garlic and health benefits associated with eating more garlic in your diet. The end result is an invaluable reference guide for anyone interested in garlic, with The Complete Book of Garlic providing exactly that — a detailed, illustrated guide to help you grow, eat, and enjoy garlic. Other good garlic books have been published over the years but they’re unfortunately not still in print and difficult to find. As far as things to look for, the very best garlic books share several common threads: they’re written by people who have gotten their hands dirty growing and eating garlic and they have numerous illustrations and/or photos.